Content is king in our tech-savvy ages; we also know how overwhelming the conceptualisation, execution and tracking of the contents performance can be. 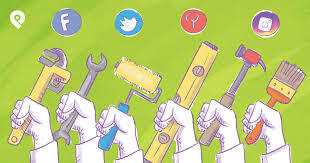 There is a list of social media tools as long as my arm, waiting for you to choose it for it’s fancy bells and whistles, and endless promises of better engagement, unicorns and mermaids. Is this content system helping me streamline my processes? This question might actually be hard to answer until you start. While you may enjoy using the first social media tool you try, you might not realize what you were missing out on until you try your hand at a completely different tool with different priorities and functionalities. It’s important to test out a number of different tools before deciding on the right one for you. Although they may not advertise it, if you ask for a free trial, you’ll more than likely get one. When choosing your tool, think about the content creation process step-by-step and make sure your new social media tool fits the bill in every department. Does it help make the process of content creation less overwhelming? Does it help you plan out your content before you come to write it? Does it help you work with others? Does it let you check on progress? Is it ACCURATE? It’s pretty common for social media tools to be too focused on the end goal; scheduling and publishing your content. As a result, many people are turning to the likes of spreadsheets for the sake of planning, alongside using a social media tool to schedule the content when they could be using a tool that fills both shoes. Does it excite my creative side? Do I WANT to create content? Or is it a hindrance to my creativity? Passion is important. If you’re a marketer or digital anything, you need approximately one million times more passion than any other profession. So much passion that you can dedicate the excitement of a kid getting a puppy to each and every one of your clients. Using a complicated content tool can sap the life out of anyone. A tool that send jpg.’s of balloons smashing across your screen when your SEO hits target, or you reach a certain amount of social shares – that is going to energise you. You’ll probably create better quality content too. Keep an eye out for a “simpler” tool with more graphics, less steps to take, and an option to save and therefore automate processes once you’ve perfected them. Are you learning anything from the content tool? If you’re thinking about your long-term goals, you need to be making use of a social media tool that comes with analytics. You need to regularly check in with your content performance to assess which posts are receiving the best engagement and helping you grow – otherwise, what is the purpose of your hard work? If you don’t want to waste your time and energy on ineffective content, then you need to maintain an awareness of your results in order to improve for the future. Define what you want to track and find a tool that will give you this information in a clear and digestible format, whether it’s follower growth, engagement levels or search engine rankings. Does it allow others to work with you, or do you need to pay more for that? You’d be surprised how much time you save when you’re using a tool that’s built for teams. Your usual social media tools are often built for bigger businesses and brands but if you’re looking for something to help you manage approvals, minimize risk (such as rectifying your auto-corrects attempt to sabotage you by changing Hugo to Huge in a perfume advert), manage multiple accounts, and communicate with your team (or clients) on upcoming content, then you need to factor in these requirements. Is it worth it? Should I work it? Or flip and reverse it? Sick of creating content? Let us do it! Get in touch today! This entry was posted in Social Media Management, Social Media Tools. Bookmark the permalink.